Let’s start with the most important part first. Your primary goal while in residency/fellowship is to become a great doctor. The kicker is that you also have to devote some time to your finances and not completely neglect them. 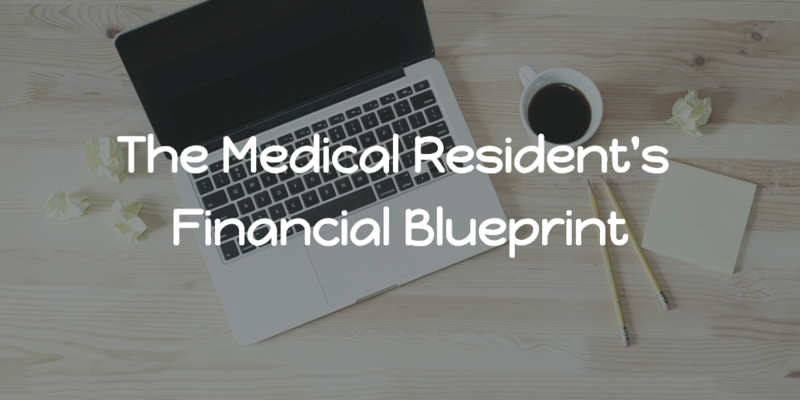 We will outline the few financial items you should worry about while in residency. If you don’t have student loans, go ahead and skip to the next item; however, the unfortunate fact is that most medical residents are straddled with student debt and lots of it. Personally, I think getting your student loans organized as an intern/PGY-1 is one of the most important financial tasks a medical professional can do. I already wrote another blog on this topic, which can be found here, but let’s review why this is so important. The desired goal of any medical professional should be to have their student debt forgiven, thanks to Public Service Loan Forgiveness (PSLF). The best shot you have at PSLF is by starting your debt payments right out of medical school. PSLF will require 120 payments (10 years) on your federal consolidated loans to have them forgiven. The 10 years are critical because your residency/fellowship can be anywhere from three to seven years. Let’s assume it takes you six years, you now only have four years left to qualify for PSLF. Consolidate your federal loans and make sure they are direct loans. Make sure you are using an income-based repayment plan. Don’t consolidate any federal loans with private loans; you will lose your option for PSLF. Once your salary increases with your first medical contract, so will your student debt payments since you are using an income-based repayment plan. With any private loans, it is a good idea to look to consolidate those loans and shop around for low and fixed rates. Here are some companies that can help you with private loan consolidation: First Republic Bank (Over $60K), CommonBond, So-Fi, and Earnest. I know, I know, you hate this word, but it is important! The good news is that budgeting should be much easier as a resident because you probably have your first regular paychecks coming in. Most residents fall anywhere from $45,000 - $55,000 for an average salary. We did write another blog on budgeting for medical residents and provided an excel spreadsheet to help you build your first budget; both can be found here. You may feel “poor” as a resident, but the reality is you are making as much as the average US household, so I have faith that you can successfully build a budget and follow it. Tip of a lifetime: Even as an attending, try to live off of your resident budget for at least a few years. Build up your savings, pay off any debt and student loans, save for a down payment on a home, max out your Roth IRA and Roth 401k/403b. Please don’t buy a mansion and exotic car with your first medical contract, I beg of you! I am a little bit more aggressive here and like to usually see three to six months of income in your emergency fund (others recommend three to six months of expenses). If you are making $50,000 a year, your emergency fund should fall between $12,500 and $25,000. Put money away each month into your savings account, NOT your checking account. Make sure you keep the accounts separate. I promise life will happen and you will need a sum of cash at some point (most likely numerous points). If you have an emergency, and you are stuck living paycheck to paycheck, you will probably take the easy (and wrong) road…put it on a credit card. It is very DIFFICULT to live paycheck to paycheck and “hope” that you can pay off your entire credit card bill each month. We could probably stop there, but I will add some more details for you. Unless you already signed a medical contract to work in the same city as your residency, you should not be a homeowner. Start with the basics; you work 20 hours a day = you will never see your home. You’re a resident, so you probably don’t have enough money for a 20% down payment. Do not listen to the mortgage broker and/or real estate agent tell you that they can get you into a home for only 3% down. They are salespeople and salespeople survive on commissions and will do whatever it takes to get that commission. Some physician’s loans will even allow you to do 0% down with no PMI, don’t take the bait! Anything less than 20% is not financially smart. Homes are expensive to buy and maintain. Most buyers forget to include closing costs, escrow (property taxes and homeowner’s insurance) and annual home maintenance costs when picking out their dream home at 30 years old. Tax breaks are not very attractive for home ownership as a resident. Your salesperson (sorry, I mean realtor) will hype these up but believe me, they are not attractive just yet. Unless you bought a mansion, your standard deduction should be greater than your itemized deductions (aka mortgage interest). In laymen terms, you don’t need to own a home to get the larger standard deduction. Everyone gets the standard deduction. Malpractice should be a no-brainer. However, you also want to make sure you have reliable disability coverage in place and possibly a term life insurance policy if your situation requires it. We have a detailed blog post that will walk you through disability insurance and life insurance. It can be found here. Investing comes last on our list for residents because if you take care of all the above items, investing should come pretty easy. Don’t ignore investing as a resident. Your best chance to take advantage of compounding interest is this exact moment. Look for a Roth: Roth IRA, Roth 403b, and/or Roth 401k. The first rule is to always take advantage of any employer match. If your hospital offers a 100% match on your first 4% of contributions to your 403b, elect to have 4% of your salary go into your Roth 403b and the 4% match from the hospital will go to your 403b (sorry they want the tax deduction which is why they won’t put it into your Roth). Once you have done that, open your own Roth IRA. You will be able to contribute up to $6,000 per year to that account (2019). If you have done all of the above and still have room to save, head back to the employer plan (Roth 403b from our example). Learn and absorb as much as you can about personal finance. You don’t have to be an expert, but know enough to make sure you are not being taken advantage of. Visit Amazon and buy Dr. James Dahle’s book, The White Coat Investor and/or Dr. Jeff Steiner’s book, The Physician’s Guide to Personal Finance. They are both excellent reads and do an exceptional job equipping you with the knowledge needed to protect yourself. At the end of the day, your time is much more valuable being an outstanding doctor than a financial guru. Find a great advisor that you like and trust, ask the right questions and hire him or her to help you with your financial planning for decades to come. Please feel free to email or call us with any questions or comments. We look forward to hearing from you!